Around where I live, I’ve been the biggest champion (or complainer) of avoidable roadway hazards with my car. Ever since my father told me about the depth and size of a pothole being a detriment to a car’s alignment and tires, I’ve always tensed up every time I accidentally run over one. Doesn’t even matter if the hole was the size of a baseball, I still think deep down that my tire’s going to pop or the axles will somehow be affected. Oddly enough, though, this taught me to be more aware of road hazards and be a better defensive driver than I give myself credit for. 1. Road Signs: Unless you failed the portion of the driving test or just tend to ignore specialized road signs such as the one above, chances are you’re setting the car up for an accident down the road (literally and figuratively). 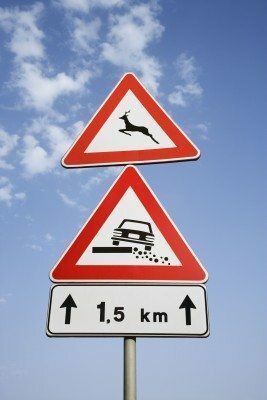 Whether it’s deer crossings to make drivers aware that a forested area or dense part of a neighborhood has a pretty extensive deer population wandering about on down to uneven roadway construction signs to help make drivers use caution when passing through, paying heed to any and all road signs is the first order of business. 2. Potholes and Other Fissures: One of the biggest reasons drivers have minor problems with their car’s steering is from altered alignements or bubbles in their tires that cause one tire to leak faster than the rest. The main culprit for these particular issues tends to be from potholes littered across roads and highways. What starts off as a tiny fissure can quickly balloon into a sizable pothole because of the amount of pressure forced onto it from cars and trucks or it’s just a case of simple erosion caused by constant rain and or snow. Whatever it is, road crews are sometimes unable to get to every single one fast enough meaning they should warrant driver’s attention more often. 9 out 0f 10 times your car’s going to roll over them without issue, but why risk the ten percent and instead just keep a watchful eye? 3. Weather Conditions: Yet another obvious candidate that’s only in here because some drivers are just not as extra cautious as they should be when the roads are littered with snow or rain. For some reason or another, drivers with 4-wheel drive sometimes think their car’s invincible to slick roads. Icy conditions or slick, wet roads don’t discriminate between 4-wheel drive or front-wheel drive. Speed and control are going to be the main factors every time, and if you’re not being cautious, slowing down your speeds and giving more room than usual to stop, the road conditions may just surprise you with a fender bender or two. 4. Other Drivers: This harks back to the defensive driving mention earlier. Defensive driving tactics such as looking both ways after a light’s turned over before passing, slowing down when approaching a constant green light, avoiding loud music or other distractions from drowning out police/ambulance sirens up ahead and being two car lengths behind the car in front of you…these are just a few examples of safe, defensive driving to either start doing or polishing to a mirror shine. There will always be aggressive drivers on the roadways, but that doesn’t mean you should follow suit. And that last point can more or less be a remedy to the other one’s mentioned before it. Safe driving is all about being aware of your surroundings while behind the wheel. Thinking something’s up ahead (whether it is or isn’t) is better than day-dream driving any day of the week because at the end of the day, assuring the well-being of yourself and others on the road is what matters most. About The Author: Kyle is a contributor on car-related topics, from automotive care to driving safety and writes for and about used car dealers in Springfield, comparing specific car models and other related subjects.